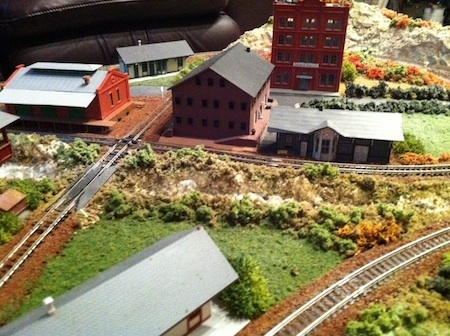 A great way to get started in model railroading is to create a small train layout that doesn’t require a lot of space or a huge investment of time and money. 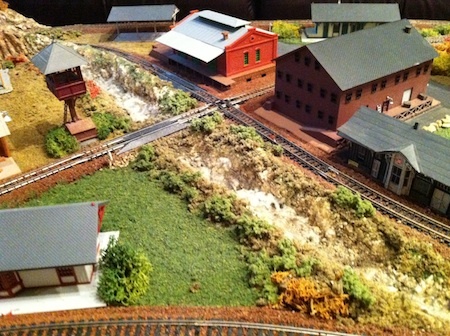 This small layout can be used later to expand into a much larger model railroad if you wish; or you may want to keep it as is and continue adding details and making changes as time goes on. The other nice thing about it is that you can do the whole thing sitting down without a lot of standing or crawling under the surface to get it done. 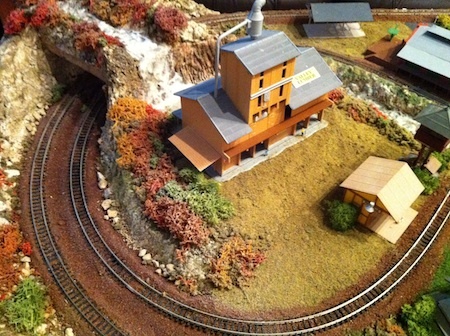 It could be a small point-to-point switching train layout, or a loop-to-point or loop-to-loop configuration. 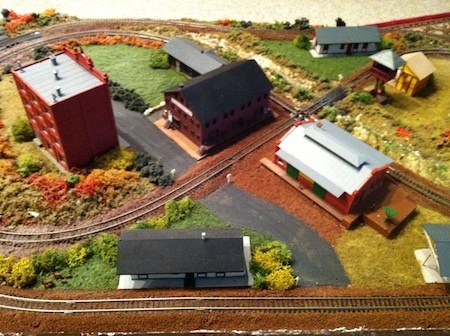 The following is a step-by-step creation of a 24” x 48” N-Scale loop-to-loop small train layout with 2 separate mainlines, each containing its own train, simplified by the absence of branches or turnouts. The 2-train action provides more interest than a single train going around an oval, and the absence of turnouts reduces risk of derailment. I made this for my six-year-old grandson, and I didn’t want him to be having frequent derailments if I could avoid it. You could certainly make the train layout more complicated by adding branches and by increasing the surface space to 30” x 60” or even 36” x 72” but it would cost more work and more money. It just depends on want you want and what your budget allows. 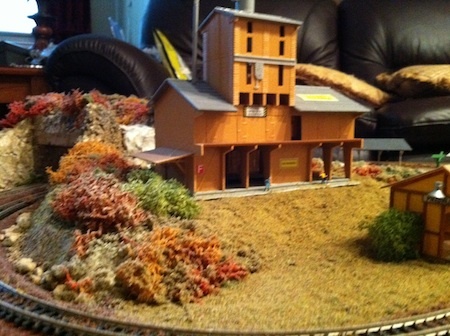 I spent 2 years on a 36” x 72” N-scale train layout. The one I’m going to describe here took about a week (about 25 hours of work). Of course, with this one I had a deadline. His birthday was coming up soon and I wanted to give it to him as a present. I discovered later that the 2’x4’ size would be perfect for a coffee table train layout, which would be a great application for this project, although I didn’t use it for that in this case.Next, I used Liquid Nails to glue the foam sheet to the plywood. 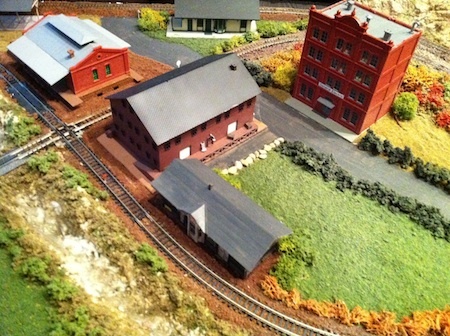 The next step is to design the model train layout. Pick a theme, locale and an era to represent if you’re doing a serious layout. In this case, I just wanted him to be able to at least “pick up” and “deliver” passengers and freight from one part of the layout to the other. 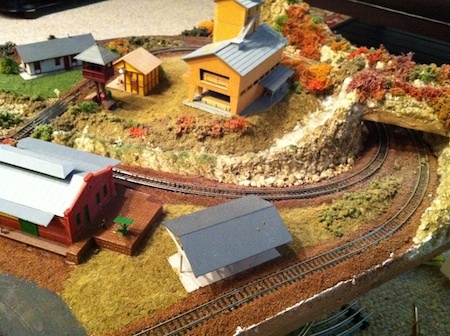 This is part of the educational benefit children can get from operating a layout like this. Something should be transported from one place to another. I purchased an inexpensive ($99) model train set from the local hobby store so I could get some track, a power transformer, a train and a few accessories. Then I sat down in front of the train layout surface and tried to figure out how I wanted the track to be placed. Since this was a fairly simple layout, I didn’t really need to do extensive track planning. I used the Bachmann track (with the roadbed already attached) that came with the set to place an indented oval on the layout surface (kidney-bean shape). I had to use a few extra sections of track that I had on hand to complete this. I wanted to create a second mainline inside the oval, but the standard sections of track that you buy in the store had too large of a radius to fit inside comfortably. I already had some Atlas flex-track in my train room that wasn’t being used, so I confiscated four sections of this to make the second mainline as a figure eight inside the outer oval. I then glued down some cork roadbed to form the loops of the figure eight where the flex-track would be placed using foam pins to hold the roadbed in place till the glue dried. The flex-track had to join in the center with a 90-degree cross track (by Bachmann), so I pinned this (the crossing track) down in the center of the train layout where the four sections of roadbed came together. I then site-measured the length of flex-track that I needed to make each loop and cut the rails at the appropriate place with rail nippers. Then I installed the flex-track by pinning it to the roadbed to hold it in place and applied 50% diluted white glue with isopropyl alcohol (rubbing alcohol) added to thin the glue to make it flow underneath the rails. After letting this dry, I removed the pins. I also glued down the oval outer track at the same time. You may want to hook up the power and test the track at this point in order to make sure that you don’t have to change anything before moving on to the terrain and the scenery. You should be able to run a small train with a consist of one engine and 3 cars backwards and forwards around the entire train layout starting and stopping without difficulty and without any derailments. If not, now is the time to do some troubleshooting to be sure the operation is flawless. Make sure the tracks are clean. I usually use Goo-Gone for this step. Then I apply transmission fluid, or in a pinch WD-40, to the rails with a clean cloth all around the train layout. This will improve electrical performance greatly. I had a little trouble with the crossover but with a little tweaking, filing and cleaning, it worked fine. I ran the wires from the two sets of rails, threaded them under the rails where necessary, and embedded them into the foam-board so they would not be visible through the scenery and then had them exit from the side of the foam at one corner of the layout to the two transformers - one to power the inner track and one for the outer oval. At this point I would recommend covering the tracks with masking tape so that you don’t get a lot of plaster or glue on them. I tend to skip this step because I think I will be careful not to get anything on the track while I’m doing scenery, but I always wish later that I had done it, because cleaning the track that is full of plaster droppings and glue is a real pain. 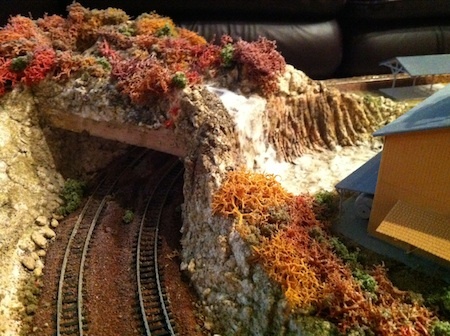 I wanted both trains to go under a tunnel and I also wanted a waterfall and creek on this model train layout, so I decided to incorporate the two (sort-of) by having a mountain go over the tracks. The river-rapids would then come down from the mountain and end up in a waterfall to the river below. My ultimate rendition of this idea was probably not very realistic (having a river running on top of a mountainous tunnel over the railroad tracks), but I did it anyway. (Call it poetic license.) I used cut sections of the extruded foam-board to create this tunnel. I glued them in place with white glue and held them with foam pins till the glue dried. For the rest of the terrain, I used a combination of small sections of extruded foam cut to fit and stacked where I wanted the elevations to be. On top of that I added small sections of balled up newspaper and taped them down. I then applied plaster cloth on top of the wads of newspaper. Instantly, the irregular terrain and mountainous areas took shape. 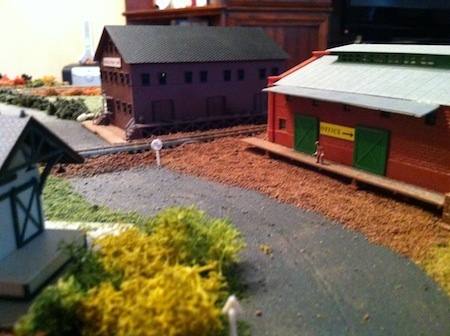 For variety, I placed a small section of irregularly cut foam board down on the inside of one of the figure-eight loops to create an flat elevation where the lumber yard would be located. The lake at the bottom of the waterfall and the creekbed would run along the side of this elevation. For the river and creekbed, starting at the base of the waterfall, I used an electrical hot-knife (Tippi) foam cutter to cut the irregular creek-bed out of the foam. Then I made some ground goop with a combination of Sculptamold and Mold-A-Scene plaster with water. I spread this goop all over the plaster-cloth and used it to build up the sides of the riverbed and creekbed and also to add more rocky definition to the mountainous areas and cliffs. At this point I started temporarily placing the structures approximately where I thought they would be appropriate and to check the fit and the appearance and to see if their positions made sense as far as the theme and purpose of the model train layout was concerned. I painted the mountains with spotted washes of earth color, burnt umber, stone gray, yellow ocher and raw umber and a trace of burnt sienna for added color in a few areas. I painted the riverbed and creekbed with almost straight (undiluted) earth color and also painted the flat, train-layout surface with a straight undiluted dark tan color, mostly just to cover up the pink foam-board. I didn’t want the pink color peeking through the groundcover later. I also painted the sides of the plywood and the foam-board the same color. You could attach stained wood molding to the perimeter of the train layout for a nice finished look at this point, although I didn't do that in this case. 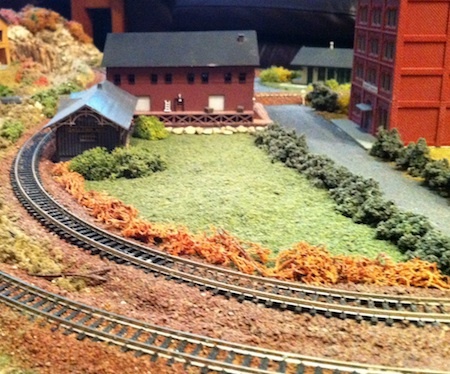 Then I ballasted the tracks on this train layout using a reddish brown mix of fine N-scale ballast. (Make sure you use the right size ballast. HO ballast doesn’t look right on an N-scale layout.) I used a spoon to sprinkle the ballast on the inside and the outside of the rails and used a brush to clean the excess ballast off the rail ties. Once I got the ballast spread evenly to the inside and outside of the rails, I carefully applied white glue diluted with water and alcohol - using a pipette so the glue would go exactly where I wanted it to, trying to avoid the tops of the rails. I soaked the ballast with the glue so that I could actually see the white glue rising to the surface in the ballast. After it dried, I used a stiff brush to get rid of any excess ballast that was still between the rails. For the flat areas of the train layout, and with the buildings in place, I applied different variations of turf in different areas to see how it would look before using any glue. I separated some of the areas, or scenes, by using different colored green turf lined by dark green bushes (clumped foliage) and by rocks in one area along the driveway by the freight house. I then applied very dilute glue with water and alcohol using a pipette gently soaking all the flat areas where I had placed the turf, the rocks and the bushes. I applied the diluted glue on the turf all around the outside edges of all the structures. The diluted glue will soak under the structures and hold them in place when dry. Then with undiluted glue, I placed small pieces of lichen around the structures to represent trees and bushes. 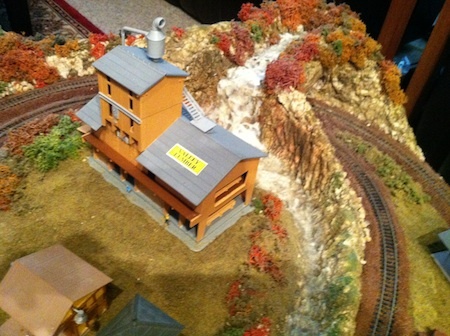 When working in N-scale, sometimes this is enough to represent trees. If you want taller trees, you can make them as described on other pages. In this situation, I thought the placement of the lichen looked good enough that I didn’t really have to add trees to get the proper effect. For the river rapids and waterfall, after painting the beds and placing small rocks and twigs (dead logs) in various areas, I used high gloss acrylic gel to model the moving water and to make the waterfall using a small spoon and my finger mostly to spread the gel. It hasn’t quite dried yet in these pictures, but it should be a little clearer and less white when it dries. I placed some blended fine turf and coarse turf and some lichen to simulate vegetation along the edges of the river and the creek. As the final step, I cleaned the track again with Goo-Gone and used an abrasive block on any section of track where glue had been left to dry. I vacuumed off any loose gravel or turf from around the tracks. Once again, I applied a small amount of WD-40 with a small dry cloth. I retested the track to make sure that I could get two separate trains to run flawlessly on both mainlines – backwards and forwards. See another small project that you may want to consider for winter. 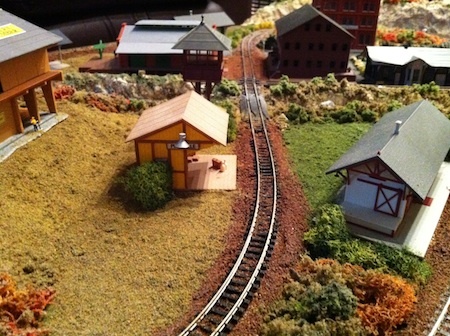 From "Small N Scale Train Layout" to "HomePage"